Some online gambling news with a twist this weekend from Oklahoma, where the state’s Cheyenne and Arapaho tribal nations have called on Obama Administration officials to approve a first-of-its-kind deal between the tribes and the Oklahoma state government that would allow the two tribes to open up real-money online gaming sites including poker, that would be open only to non-US (international only) players. The first news of the tribes’ request for federal approval — though it’s not entirely clear that it’s needed — comes from a story at the Indian Country Today Media Network, with quick pickups today in poker news circles by CalvinAyre.com and Victor Rocha’s PechangaNews site, in addition to here at FlushDraw. According to ICTMN, the joint Cheyenne/Arapaho government, headed by tribal Governor Janice Pairie-Chief Boswell, took down a play-money site at PokerTribes.com earlier this year as it entered initial negotiations with state officials. And as for Oklahoma’s state government, the deal which they signed with the Cheyenne-Arapaho officials is something of a freeroll: Since the site wouldn’t be open to Oklahoma residents (or other US states) anyway, the 20% of revenues they’d get if the feds give the go-ahead is essentially found money. 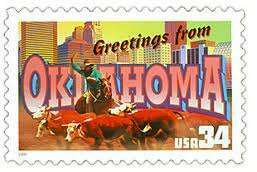 The state already boasts several large land-based tribal casinos, including the Choctaw operation at Durant, much of the income from which is pulled in from Texas residents driving up from Dallas-Ft. Worth. Here’s an element to the proposal that a lot of casual online poker players might not realize. While this might be a “first of its kind” proposal for a real-money site based in the United States, it’s not really a new deal at all. The Merge Network, one of the largest US-facing online networks, is based in Australia, but for years the network and all its member skins were closed to Australians. ICTMN also reports that the Cheyenne and Arapaho tribes have also launched an advertising campaign in Oklahoma in an attempt to generate grassroots lobbying support. The gist of the argument being offered, according to the piece, is that the largest national tribes are using their lobbying power at the federal level in much the manner as has happened in the state of California, where unreasonable demands for exclusivity and tribal sovereignty over legal matters stretching beyond tribal nation borders have essentially stalemated online-poker and online-gambling issues. California’s forward movement on online poker has spun in circles for at least six years in the face of such tribal demands, while at the federal level, the major tribes remain enmeshed in theatrical hand-wringing over the thought of a lucrative market slipping through their grasp. Back in February of 2012, the US Senate’s Indian Affairs Committee conducted a hearing on the matter of online gaming entitled “What’s at Stake for Tribes?” The hearing accomplished nothing, nor have the 18 months since brought any forward movement. Meanwhile, from Oklahoma, there’s another approach. As the state’s tribal officials have pointed out, it’s a win-win for all involved. The tribes and the state can gain revenue from Oklahoma online gaming, and they can do it without actually expanding any gaming opportunities within their own borders. Meanwhile, the presence of such a site would further legitimize the notion of US-based online poker sites in the eyes of the general public.